AIM members from small and medium size museums are eligible to apply to the AIM Preventive Conservation Grant Scheme and the AIM Conservation Grant Scheme. Both schemes are generously supported by The Pilgrim Trust and the next round of applications closes on 30 September 2016. Since these grant schemes started, hundreds of AIM member museums and heritage sites have benefited, and both schemes have been set up to help develop a more sustainable approach to the conservation and management of collections. To check your eligibility and for further information, please see the AIM website: AIM Grant Schemes. We like to showcase examples of successful applicants, so that anyone thinking of applying can see the type of conservation work that AIM has previously funded. The following is a report from the American Museum in Britain in Bath, who were awarded £5000 awarded for the purchase of an ELTEK environmental monitoring system. The American Museum opened in 1961 and is the only museum of American decorative and folk art outside the United States. Housed within a Georgian manor house and a modern exhibition gallery, the museum is surrounded by beautiful gardens and countryside. As part of our mission to conserve and protect our objects, we monitor the environmental conditions throughout the whole Museum, including storage spaces. Our old system consisted of five mechanical thermohygrographs. They took a long time to manually calibrate and change their paper charts. They were also bulky and needed to be readily accessible for maintenance, which meant they couldn’t easily be used inside display cases. We investigated many replacement monitoring systems, from standalone loggers such as the famous TinyTags to fully integrated systems with alarms and flood detection capabilities. We also consulted other museums to learn from their experiences. A wireless system was clearly an advantage and the principal reason for our decision to buy the Eltek system was its robust wireless communication – over a large museum site, the communications must work reliably and accurately. The installed system is living up to our expectations and we are very grateful to AIM. Thirteen Eltek GD10 sensors are spread throughout three floors and two buildings. They feed data back to the base station and we have instant access to environmental information over our computer network. Coupled with the lengthy battery life of the units, this has already meant a huge reduction in the time required to attend to each logging location. That saving in curatorial time means we can have more loggers than before and, as a result, monitor much more of the museum. Most importantly, this new system is providing us with much better data about the conditions in the Museum, which, in turn, is providing us with the opportunity to pursue national loans. AIM Workshop: What’s Eating Your Collection? Moths munching your textiles? Beetles in your carpets? Learn how to spot the pests in your collections at this new workshop for AIM members. Funded by The Pilgrim Trust, this free workshop for AIM members will take place in Bodmin, Cornwall on 6 May 2016 at Cornwall’s Regimental Museum. Staff, Trustees and volunteers from AIM member organisations can attend the workshop for free and it is suitable for anyone who has responsibility for collections that wants to ensure that they are not being damaged by insects. *Why are insects in museums and which ones are problems? *What does insect damage look like? *How can we find out if insects are present and where they are located? *Where in buildings might problems occur? Participants will also learn how to monitor appropriately and how to assess a building for possible risk areas. At the end of the course the participants will be able to implement an IPM programme in their museum. Run by Jane Thompson – Webb, the Conservation Team Leader at Birmingham Museums Trust, this fun and hands on workshop starts at 10.30am and runs until 4.30pm with lunch and refreshments included. “Excellent in content and presentation. Answered all of my questions and was a very practical session. It was also very entertaining!” Course delegate. AIM members from small and medium size museums are eligible to apply to the AIM Preventive Conservation Grant Scheme and the AIM Conservation Grant Scheme. Both schemes are generously supported by The Pilgrim Trust and the next round of applications closes on 31 March 2016. We like to showcase examples of successful applicants, so that anyone thinking of applying can see the type of conservation work that AIM has previously funded. The following is a report from The Powell-Cotton Museum who received an AIM Preventative Conservation grant of £8,942. The Powell-Cotton Museum houses a world-class collection of natural history and ethnographic material from Asia and Africa, mostly collected by the Museum’s founder Percy Powell-Cotton, collected 1890-1939. The museum’s research collection of skins is housed in ‘the Workshops’. These rooms contain over 4000 animal skins, housed mainly in wooden crates and drawers, constructed in the early 20th century. Over the last decade, the spaces have suffered increased problems with clothes moths, which have begun to damage the collections. The aim of this project was to eradicate the pest problem through the freezing of the skin specimens, the deep-cleaning of the space and the fixing of the damaged floor, which created cavities in which pests could live. The grant also enabled the purchase of metal storage furniture for the lower workshop, so that surfaces could be kept clear of clutter and the spaces made easier to keep clean. The majority of the project has been undertaken by a group of volunteers who worked one day a week for nearly 2 years, wrapping all the specimens in plastic and freezing them in the walk-in freezer the museum purchased as part of this project. The volunteers also undertook a lot of the cleaning, assisted by the museum’s housekeeping and collections teams. Help also came from the Natural History Museum (NHM), who allowed free use of their large freezer and offered expert IPM advice. Experts were also brought in to recondition and seal the floors and to assist with the move of large specimens to and from the NHM freezers. The project has led to a massive reduction in pests within the space, down to acceptable levels. We are now working with the NHM to trial a new form of moth repellent, which we hope to roll out across the museum if it is successful. The project has also provided the opportunity to fully audit the skin collection, providing us with an up to date inventory and a better knowledge of our natural history collections. If you are an AIM member and are thinking about applying for an AIM grant over the next three months, then our list of upcoming deadlines might be handy! Please continue reading for all information, links and closing dates for our grant programmes from now until the end of March 2016 or if you need any other information, please email: sassy@aim-museums.co.uk. Happy New Year and good luck with your application. The AIM Sustainability Grant Scheme, supported through the generosity of the Esmée Fairbairn Foundation, is intended to help medium and smaller sized members improve their medium and long term sustainability. To be eligible, museums must have an annual turnover of less than £300,000 or fewer than 50,000 visitors a year. Funding is aimed at projects that: explore increased and/or diversified income streams and/or develop organisational resilience. The AIM Hallmarks Awards are supported using public funding by Arts Council England. They will support museums in England to develop their work using the AIM Hallmarks of Prospering Museums. Grants will be available in sums of between £5,000 and £15,000, and we anticipate that the average award will be £10,000. The AIM Conservation Grant Scheme, supported generously by The Pilgrim Trust, is intended to assist AIM’s smaller members with conservation of important objects in their collections. Accessioned objects in any media are eligible but the reason for choosing the object must be made clear in your application. Conservation work should be carried out by a conservator chosen from the ICON register unless there are exceptional circumstances where this is not possible. AIM has developed a second conservation funding strand to its Conservation Grant Scheme, again with the generous support of The Pilgrim Trust. The AIM Preventive Conservation Grant Scheme has been set up to help small museums develop a more sustainable approach to the conservation and management of collections through improvements to preventive conservation within their museum. AIM Training Grants are available to support member museums in developing the skills and expertise of their workforce (paid or voluntary). The purpose of AIM Training Grants is to promote best practice by supporting attendance at conferences and training courses. Applicant museums must be AIM members and priority will be given to smaller museums receiving fewer than 50,000 visitors per year. From 1 January 2016, AIM Training Grants can be applied for at any time with no application deadlines. AIM members from small and medium size museums are eligible to apply to the AIM Preventive Conservation Grant Scheme and the AIM Conservation Grant Scheme. Both schemes are generously supported by The Pilgrim Trust and the next round of applications closes on September 30th 2015. We like to showcase previous examples of successful applicants so that anyone thinking of applying can see the type of conservation work that AIM has previously funded. The following is a report from Sue Mackay, the Curator at Keswick Museum & Art Gallery in Cumbria, on how an AIM Conservation Grant of £5,000 helped the restoration of a key landscape exhibit. Keswick Museum & Art Gallery opened in 1898 in a beautiful Arts & Crafts building with stunning views out to the northern fells. Following a recent £2.1m extension, refurbishment and redisplay the building now offers a fully accessible visitor attraction. 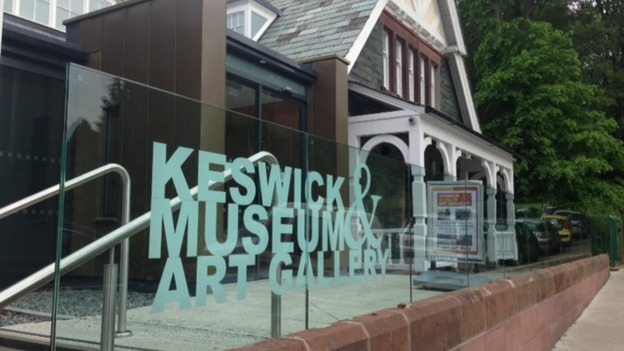 The museum cares for and shares the heritage and arts of Keswick and its surrounding parishes. The recent re-design of the museum required one of our key landscape exhibits to be removed, stabilised, re-mounted and re-displayed. Some of this work was covered in the HLF project funds but the remainder was made possible by an AIM Conservation Grant. 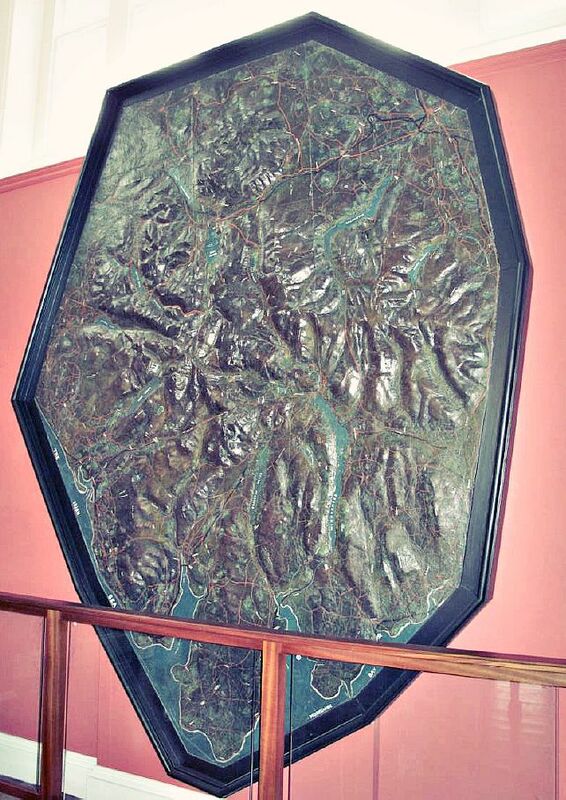 The exhibit is a large relief model of the Lake District. It was made from plaster in 1834 (before the first official Ordnance Survey of Cumbria) by local man, Joseph Flintoft. 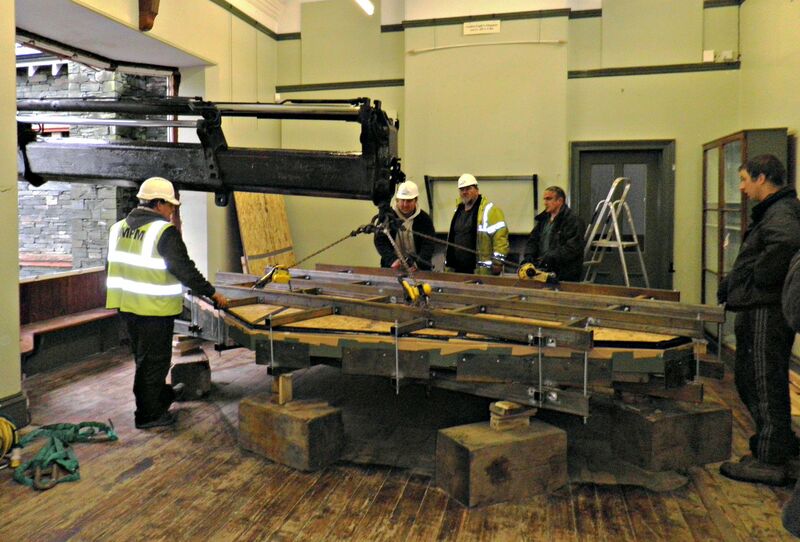 The model had to been removed and replaced through a large window opening by a specialist long-arm crane once a frame had been built to support it. This was done by a marine engineering company – MPM from Maryport – who also transported and stored the model. Moving Flintoft’s model of the Lake District – teamwork! Conservation work to the plaster work, painted surfaces and the frame were undertaken by Brian Cardy, paintings conservator from Lancashire. The model was originally to have been displayed horizontally below floor level but changes to museum design plans meant that it is now displayed vertically on the wall. We are delighted with the outcome of the conservation work which has allowed us to include this important part of Keswick’s heritage in our newly refurbished museum to best effect for all. Visitors delight once again in locating their favourite Lake District haunts! The model has also been included in the recent exhibition by University of Nottingham sponsored by Ordnance Survey which looked at the history of maps and models of Lakeland. If you are an AIM member from a small to medium size museum and you need financial support to carry out conservation, you are eligible to apply to the AIM Preventive Conservation Grant Scheme and the AIM Conservation Grant Scheme. Both schemes are generously supported by The Pilgrim Trust and the next round of applications closes on September 30th 2015. Since these grant schemes started, hundreds of AIM member museums and heritage sites have benefited, and both schemes have been set up to help develop a more sustainable approach to the conservation and management of collections. Hearing how grant recipients have used their funding is always interesting and hopefully useful for anyone thinking of applying. The following is a report from The Royal Green Jackets (Rifles) Museum, Winchester on how an AIM Conservation grant of £4,252.50 has helped to preserve a collection of seven important paintings. On 25th March 2015, His Grace the Duke of Wellington opened the Museum’s special Battle of Waterloo Bicentenary Exhibition, ‘With the Rifles to Waterloo’, on which £400,000 has been expended. A substantial part of that sum has been used to create a multi-functional space including an art gallery to showcase the Museum’s fine collection of Waterloo oil paintings. A year ago, however, the collection was not so fine. It was badly in need of conservation and, with all the available money being spent on other aspects of the exhibition, the Museum applied for the first time for an AIM conservation grant. The application was for the conservation of seven paintings, with each the subject of a prior condition report by a fine art conservator listed on the Conservation Register. 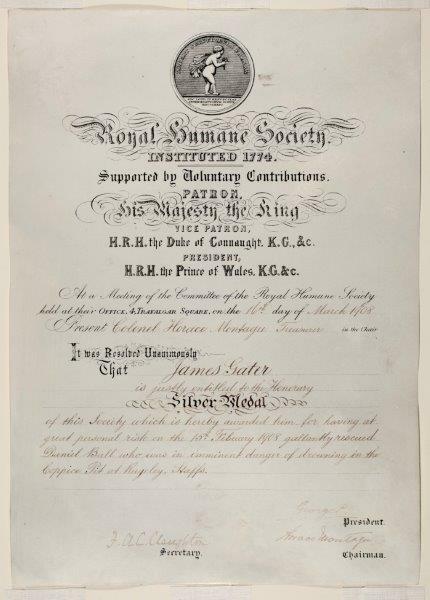 Completion of the application form was straightforward with justification for conservation focused on the importance of displaying the paintings in the best possible condition as part of our Bicentenary Exhibition. We could not be more pleased with the outcome. The creation of the gallery with proper lighting and temperature control, combined with the excellence of the newly-conserved paintings properly displayed for the first time since the Museum opened in 1989, has already been the subject of much favourable comment from visitors – as has the overall excellence of the exhibition (open until 30th September). Apart from being extremely grateful to AIM and the Pilgrim Trust for receipt of this important grant, it has already had other beneficial effect. With some of our paintings now in better condition than others, it has highlighted the need for us to place a much higher priority on the conservation of the whole of our collection and, by hook or by crook, to find the money to fund the cost. The following is an account from The Museum of Cannock Chase on how an AIM conservation grant of £1,280 helped with the conservation of WWI photograph and documents. The Museum of Cannock Chase is the only museum in Staffordshire holding considerable collections pertaining to the area’s coal mining industry. There were four framed works in wooden frames with unstable mounts which were beginning to leech onto the documents and photograph which were in need of conservation. Two of the works related to the new coal mining gallery and two related to World War 1 soldiers in the immediate area. Coloured photograph of Norman Bishop. Mr Bishop lived in Hednesford, fought in and survived WW1. 1914-1919 Framed address to Mr Sydney Young for his service in the Great War. 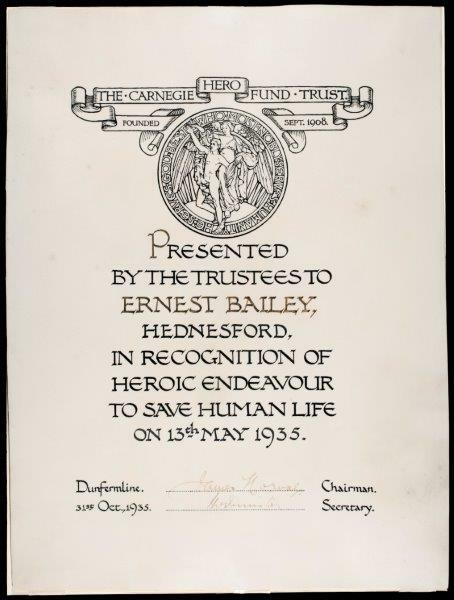 Award to Ernest Bailey 1935 by Carnegie Trust. Accident West Cannock Colliery No 3. In line with our care and conservation plan, the objects were high priority as we wanted to exhibit the two World War 1 items in the museum during the period of the Great War commemorations. In addition we are keen to introduce items from store into the new mining gallery at regular intervals. These items could not have been displayed because of their condition until they were conserved. The works were taken for conservation to Louise Vaile at Ogilvie Vaile Conservation – based at Birmingham Museum. The documents were removed from their frames, stabilised, remounted and placed in frames with low acid mounts so that we can preserve them for future generations. The following is an account from Plas Glyn y Weddw on how an AIM conservation grant of £2,765.82 helped the conservation of an oil painting. Plas Glyn y Weddw is a vibrant arts centre situated in a gothic Victorian mansion on the Llŷn Peninsula, north Wales. Built in 1857, the house was first opened to the public as an art gallery in 1896 and is today run by an independent charitable trust and supported by a Friends Organisation and a strong team of volunteers. The award of the AIM Conservation Grant has ensured that essential conservation work has been undertaken on a historic painting enabling it to become a centre point of a new exhibition celebrating the 150th anniversary of the arrival of the first Welsh settlers at Patagonia. 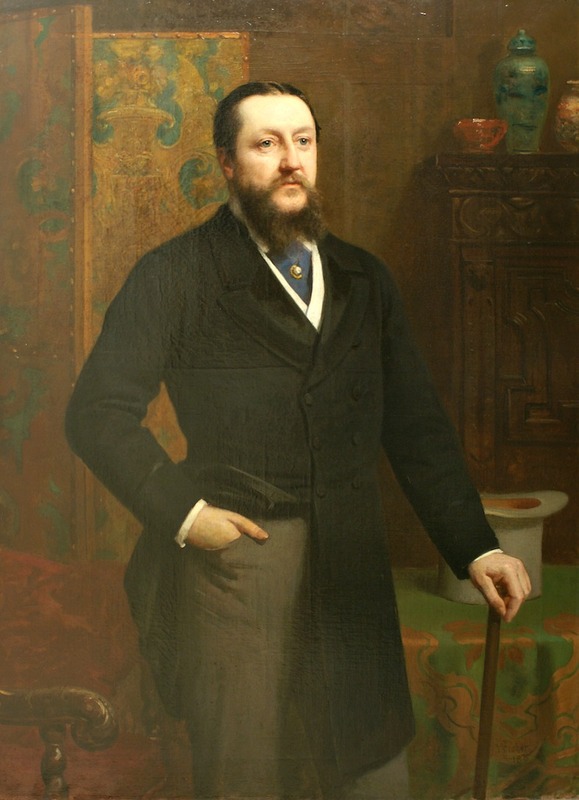 The portrait of Sir Thomas Love Duncombe Jones Parry (1832-1891) esquire of the Madryn estate in Llŷn and owner of Plas Glyn y Weddw, was painted by W. Fisher in 1875. Sir Love Jones Parry was a prominent figure in Caernarfonshire during the second half of the 19th century and played an important role in the establishment the Welsh colony in Patagonia. The conservators responsible for the work is Rachel Howells, and Hannah Tempest, the painting had been in storage for a number of years, and had suffered water damage in the past, the paint was flaking, from the work undertaken involved consolidation, surface dirt removal, structural treatment and stretcher work, repair of a tear and hole, re-varnishing and frame conservation. The painting’s relevance to this particular exhibition and to the history of the building will attract more visitors to Plas Glyn y Weddw and will create opportunities for children and adults to learn about the establishment of the Colony and the Jones Parry family who built the mansion. Plas Glyn y Weddw is staging the ‘Patagonia 150’ exhibition from 17th of May until the 12th of July 2015. The following is an account from Bethlem Museum of the Mind on how an AIM conservation grant of £1,560 has helped to conserve two iconic statues. Bethlem Museum of the Mind is a newly renovated museum situated within the grounds of Bethlem Royal Hospital. We have recently moved into our new building, and our much improved and enlarged gallery spaces offer visitors the chance to explore the history surrounding mental health and its treatment, as well as engaging with and questioning wider issues associated with mental health. The grant applied for from AIM was intended for the conservation of the museum’s two prized possessions, twin Portland stone statues of ‘Raving’ and ‘Melancholy Madness’, created by Danish sculptor Caius Gabriel Cibber (1630-1700), circa 1676. The statues were originally located at the hospital’s Moorfields site, and depict the two main diagnoses of mental disorder at the time. Over time the statues have been eroded and cracks have formed. The overall project aims involved the conservation of the damage, as well as the installation and interpretation of the statues within the new museum foyer on new supporting plinths. The scope of the grant allowed specifically for the conservation of the statues, the aim of which was to stabilise the statues for permanent display. ICON registered conservators Taylor Pearce carried out an initial assessment, before undertaking the work. Old resin repairs were removed and new, more suitable, repairs were implemented. Assessment of the steel pins inserted in 1975 was also carried out. The installation process was also overseen by Taylor Pearce, and museum staff. All conservation work was done in situ, after the statues had been installed in their new home. The statues now sit proudly in the grand art deco entrance to the new museum, in a stable and secure state, post-conservation. A proven talking piece for visitors and staff alike, they dramatically command attention, and encourage debate, as was intended with their new positioning and location.